Some books you find interesting, some you find insightful while only a few would feel like they understand you and were written especially for you. I felt this way when I read “Big Magic” by Elizabeth Gilbert a couple of years back. Over the past one week, I was engrossed in Cal Newport’s "So good they can’t ignore you”. The underlying message felt so relatable and clarified many questions that were haunting me. Last year, I read “Deep work” by the same author. It was such an insightful read on how our distracted daily routine with multitasking and busyness derails our ability to engross in deep, meaningful work with utmost focus. Here’s my detailed review. If you haven’t read the book, I highly recommend that you check it out. 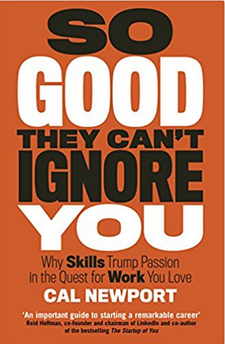 “So good they can’t ignore you” as the subtitle suggests is all about why investing in building skills is more important than mere passion in the quest for work you love. I find these two phrases - “identify your passion” and “do the work you love” to be quite ambiguous and misleading. Does that mean that all of us need to identify what we love when we decide on our college major? It is an extremely tough ask if you haven’t had enough exposure to various options while growing up. As people grow and evolve, interests and passions also change. Coming back to the book, the author details out the pitfalls of adopting the “passion mindset”, a focus on what value your job offers you. “When you focus only on what your work offers you, it makes you hyperaware of what you don’t like about it, leading to chronic unhappiness”. As an alternative, he recommends what he calls the “craftsman mindset”, a focus on what value you are producing in your job. “Regardless of what you do for a living, approach your work like a true performer”. The main outcome of adopting a craftsman mindset is to work on acquiring your career capital. Identifying these rare and valuable skills, consciously stretching yourself through deliberate practice and seeking out active feedback are ways by which you go about increasing your career capital. The career capital you have accumulated would help you find great work - ones that offer rare and valuable traits such as control, creativity and impact/mission. Control - gives you command over what work you do, when you do and how you do it. It is one of the powerful motivators of a fulfilling career. An overarching mission enables one to look at their career as a way to make a meaningful impact. In order to make this mission come true, the author recommends a strategy called “little bets” - small and achievable projects that help one to learn from small but significant wins and lots of little failures. These little bets also need to remarkable - compelling people to remark about it. This might sound like a lot of theory, but what I have learned is that irrespective of the work you do, you need to consciously build rare and valuable skills. This “career capital” would help you achieve those traits of great work like working towards a mission, having control over what you do and applying your creativity without any bureaucratic barriers. If you look at it, one ends up wanting to pursue their passion in order to achieve the same results. It was an insightful read with a lot of relevant examples and case-studies. At times, it does tend to get a little dragging and repetitive. But it is worth taking the time to absorb the material and ponder over it, especially if you are an early to mid-stage working professional.